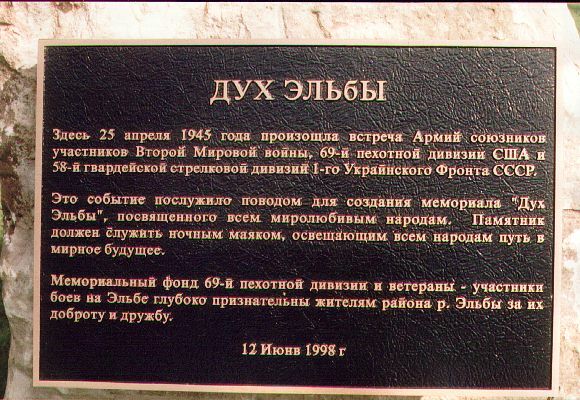 Spirit of the Elbe bronze plaque in Russian. United States of America, Washington, DC, will conduct its traditional ceremony of the laying of the wreaths to the Spirit of the Elbe memorial plaque at the Arlington National Cemetery in commemoration of the Link-Up of Soviet and troops and the American 69th Infantry Division at the Elbe River, April 25, 1945. You are cordially invited to join them at this event in the company of your wives, relatives and friends. It is expected the occasion will bring together U. S. government officials; ambassadors and diplomats of former Soviet Union countries; veterans of the 69th Infantry Division and other WWII units; students and reporters. To leave at 9:15 AM by Embassy bus to the Arlington cemetery. your name/car make/color/tag number and state to Ms. Maria Temyashova (202)-298-5701 or e-mail mtemyashova@mail.ru at least 48 hours in advance. 69ers and Attached Unit members please wear your 69th souvenir caps and Reunion name tags. After the wreath laying ceremony, the bus will bring everyone back to the Embassy for a cockail reception to celebrate the Link-Up and VEDay! We look forward to seeing you, Friday, April 24, 2009! 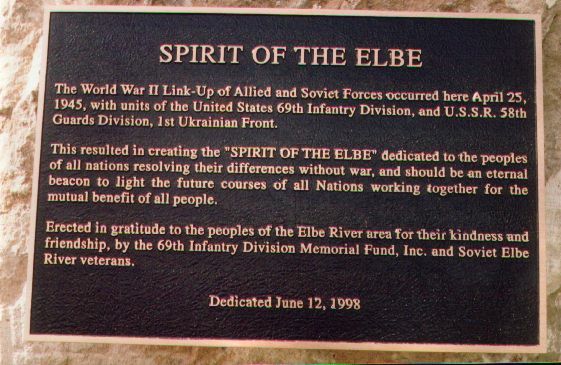 The Spirit of the Elbe lives!